When I heard in April that Theatre Aquarius was going to be putting on Agatha Christie’s The Mousetrap, I could hardly hide my excitement. It was murder having to wait six months for the play to be performed. But it was well worth the buildup. For those unfamiliar with Christie and her works, it should be known that she is considered the best-selling novelist of all time. She also created the memorable detectives Hercule Poirot and Miss Marple, who still have their own television shows and movies today. Her most famous play, The Mousetrap, premiered in 1952 and has played in England for 61 years, making it the world’s longest running play. The Mousetrap is a cozy mystery set after World War II in a newly renovated guesthouse, Monkswell Manor. The guesthouse is owned and run by young married couple Giles and Mollie Ralston (Aidan deSalaiz and Trish Lindström). On Monkswell Manor’s first night open for the public, the manor is booked out to five guests: Christopher Wren (Alex McCooeye), an eccentric young architect who fancies nursery rhymes, Mrs. Boyle (Jo Skilton), a highly unlikable woman of high class, Major Metcalf (Terry Belleville), a retired army man who we know little about, Miss Casewell (Shannon Currie), an odd woman who came to England to finish certain unnamed business, and Mr. Paravicini (Tony DeSantis), a mysterious guest who ends up at Monkswell Manor after his car is overturned in a snowdrift. After a sudden call from the police, Detective Sergeant Trotter (Simon Lee Phillips) arrives on the case, telling the already tense guests that they may all be in danger. After a woman, Mrs. Lyons, was murdered on Culver Street the previous day, Trotter believes that the murderer may be headed to Monkswell Manor. As the snow keeps the guests from leaving the manor, Sergeant Trotter tries to find out which of the guests are in danger, and which one is a murderer. Each guest turns upon the others, wondering how much is really known about the other person, who can be trusted. Can anybody? This colourful cast of characters gives The Mousetrap the perfect balance of humour and suspense. The casting choices were perfect too. Each of the actors really understands whom they are playing, and it was nice to see some new faces at Theatre Aquarius. While I felt Trish Lindström was a bit over-the-top at times, she excelled in shrouding Mollie with kindness and mystery. But it was Alex McCooeye who really stole the show. His portrayal of Christopher Wren was incredible, creating the perfect balance of eccentricity and suspicion, causing the audience to wonder if this lovable goof ball could really be a murderer. The set was gorgeous and really looked like it was taken straight out of the late 1940s. I especially loved the snow falling from the large windows of the Great Hall, which made Monkswell Manor feel even cozier. But what really makes The Mousetrap a masterpiece is the ending. Once you’ve seen The Mousetrap, you become part of The Mousetrap club, an old tradition where you must never reveal the ending to anyone who hasn’t seen the play. So who could it be? Could the murderer be our hosts Mr. and Mrs. Ralston, the unlikable Mrs. Boyle, the kind Major Metcalf, the eccentric Christopher Wren, the odd Miss Casewell, or the strange Mr. Paravicini? Sergeant Trotter is on the case. 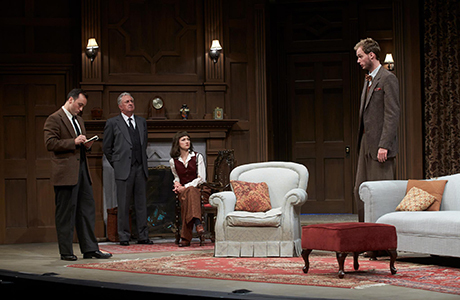 Join him, as well as our suspects, at Theatre Aquarius, and join The Mousetrap club for yourself.